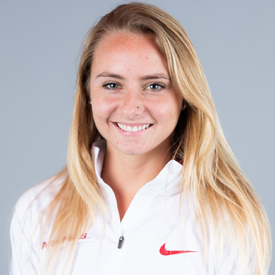 Clark started off her junior year at the UC Riverside Invitational (Sept. 16) with an eighth place finish overall and third for the Razorbacks at 20:16.50 … At her next race, the Notre Dame Invitational (Sept. 29), she finished 36th overall and fourth for Arkansas with a time of 17:09.10 … Clark finished off her outdoor season at Pre-Nationals (Oct. 14) with a time of 20:47.90, which placed her 55th overall and 6th for the Razorbacks. NCAA South Central Region Champion … Led off her second season with a second-best finish in the Chile Pepper Festival (Oct. 1) with a time of 16:19.36 which was also the fastest time for the women … At her next race, Pre-Nationals (Oct.15) she finished seventh overall and posted the fastest time for the Razorbacks at a 20:20.00 … following that, Clark led the Arkansas women to an SEC Championship (Oct. 28) victory with a time of 20:18.50, which placed her second overall and first among the Razorbacks … In the NCAA South Central Region (Nov.11) she had her best performance of the season earning her All-Region honors with a time of 20:17.40 which finished first overall, also leading Arkansas to a first place finish … To cap off her season, she finished with the second best time for the Razorbacks in the NCAA Championship. Placed second in her collegiate debut for Arkansas at the UC Riverside Invitational (Sept. 12) … She posted the top time for Arkansas running a 20:39.00 and earned SEC Runner of the Week for her stellar performance … Raced in the Chile Pepper Festival (Oct. 3) finishing second on the 5K Fayetteville course … Introduced herself to the home crowd racing to a time of 16:28.56 … Competed in the Wisconsin Adidas Invitational (Oct. 16) placing 18th overall … Crossed the line in a personal record time of 20:07.30 propelling her to another second place finish for Arkansas runners … In her first SEC Championship (Oct. 30) she raced to an eighth place finish overall … She took home a third place finish amongst Arkansas runners with a time of 20:12.80 … Clark finished the season strong at the NCAA Championships (Nov. 21) racing to 48th place in a competitive field on the 6K course at Louisville, Kentucky … She finished second for the Razorbacks posting a time of 20:31.70. 2014 Texas 6A State Champion (cross country) and meet/course record holder … 2014 Nike All-American … Finished just outside the top 10 at the Nike Cross National Championships … 12-time state medalist 3200-meters (4), 1600-meter (4), cross country (4) … Fifth place at the 2015 Brooks PR invitational in the mile … 2013 Footlocker All-American. Born on June 10, 1997 … Daughter of Eric and Wendy Clark … Has a sister, Cassidy … Majoring in kinesiology and exercise science.